When you can't have snow, there's always coconut and white chocolate. These truffles are made from the white chocolate mudcake I made on Day 3. I adorned them with random sprinkles and chocolate chips I had amongst my decorating supplies. I made them all a bit different and rough-looking. 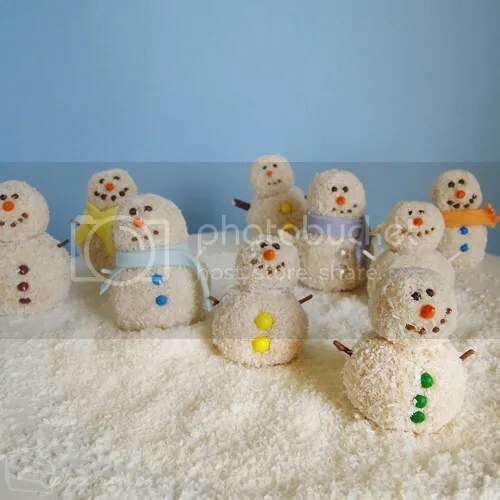 I wanted to recreate that rustic quality of actual snowmen made from whatever branches and rocks and pieces of clothing happen to be on hand. There were 9 snowman truffles all up, frolicking in the snow, looking like a happy family portrait. That is, until tragedy struck and we got hungry. You can use any white cake recipe you like, though the amazingness of the white chocolate mudcake recipe made these truffles even better. I think it's also possible in some places to buy cake crumbs, so that's another shortcut if you're so inclined. 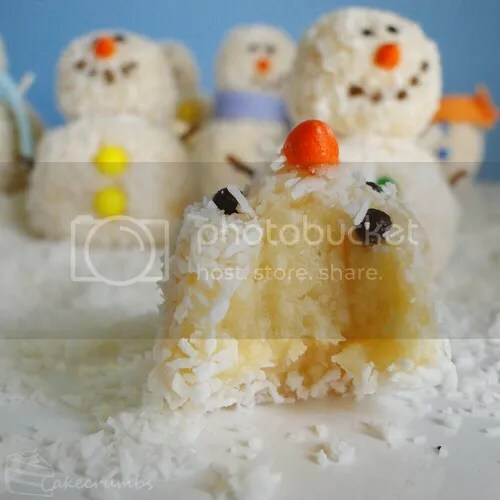 If you're making the candles from Day 3, you'll end up with leftover cake so this is a great way to use up the spare pieces. Combine chocolate and cream in a medium saucepan; stir over medium heat until chocolate is melted and mixture is well combined. Combine cake crumbs, chocolate/cream mixture and icing sugar in a medium bowl and stir until well combined. If mixture is not moist enough to hold together, you can add 1 egg white to help bind it. Stir in Armaretto or almond essence, then leave to cool to room temperature. Spread coconut onto a shallow tray or dish. Roll 1 tbsp of mixture into a ball, then roll it into the coconut mixture to coat. Repeat until you have 9 'heads'. Roll 2tbsp of mixture into a ball and do the same as in Step 3 to form 9 'bodies'. Decorate the 'heads' and 'bodies' with sprinkles. Places 'bodies' on a serving platter and top with the 'heads' and serve. If the truffles won't stay in place, you can use a little royal icing to join them together. Alternatively, you can use a toothpick to keep them together – just warn the recipients when you serve! There’s something about the last photo that has so much emotion in it. It feels like that photo alone is telling a long story. 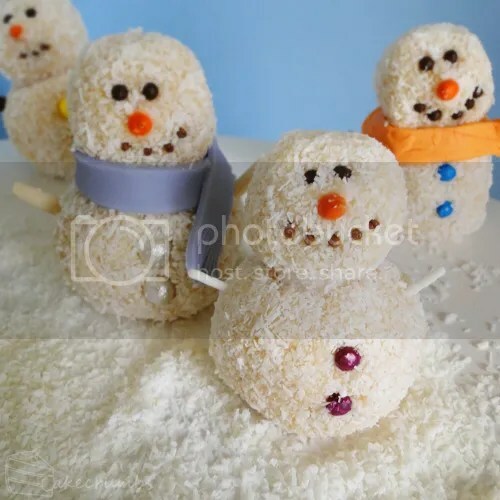 And it also reminds me of how yummy the snowmen were. 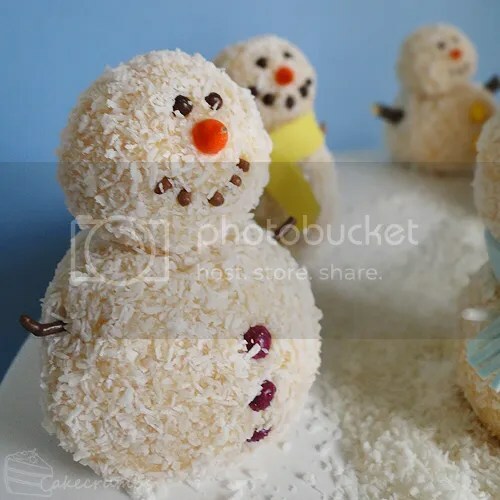 Snowman truffles! These are such a great idea and so, so cute! 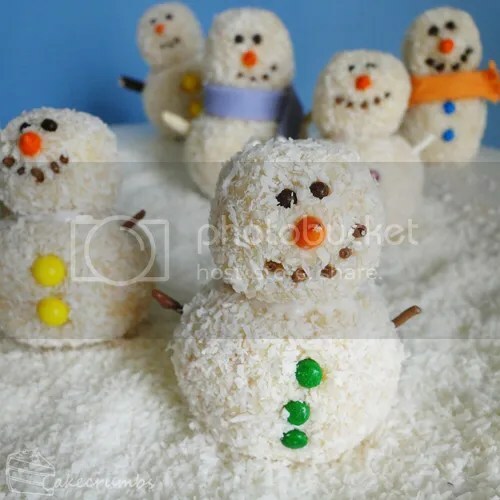 I really want to make these because my family loves snowmen. On your other notes about the climate, I’ve always wondered what it would be like to celebrate Christmas in a warm place. Very interesting. I can’t imagine sweltering weather around Christmas time, haha. I live in New Mexico in the US, so we don’t usually get heavy snow in the city (alas, not enough to make phallic objects out of), but it still gets freezing cold for us desert folk! Like you, I’ve often wondered what it would be like to experience the opposite climate! I can’t imagine freezing around Christmas haha. I adore your work… and those snowmen… my head exploded.